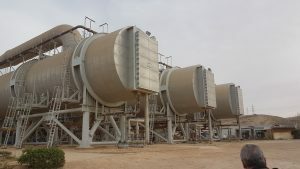 Plans dating back to 2013 to boost the water supply in Tobruk with the installation of a fourth evaporator at the town’s desalination plant are back on track with the Beida-based interim government of Abdullah Thinni approving a LD 29-million letter of credit (L/C) for international water technology company VA Tech Wabag. The contract for a fourth evaporator was given in 2013, but the political crisis prevented it from being implemented. According to CEO of the Austrian branch of Wabag, Mahmut Gedek, the fourth evaporator will have nothing to do with the existing plant which was built by France’s SIDEM between 1997 and 2000. It has seen a significant reduction in output because of maintenance problems since the revolution. The new evaporator, with a production capacity of 13,333 cubic metres of water a day, will have its own new seawater intake. Once the L/C is issued, Wabag says that the work should take no more than 18 months. “We have the designs and the engineering stage is completed,” he said, explaining that it was now a matter of purchasing the equipment, installing it and bringing it on-stream. The cost of the project, at almost LD 29 million, was set at a fixed rate of some €17 million. “We are committed to the Libyan market,” added Gedek who stressed that, despite the situation, business continued. “We have on-going projects in the country and have a local network and the organisation to build other projects,” he said. Among those on the books the just completed industrial water plant for Tripoli West power station. Other Libya contracts include a demineralisation plant for the power plant at Tobruk as well as an electrochlorination-plant for Tobruk and another for Derna power station. At the latter, commissioning works are ongoing and should be completed by end of the year, Wabag noted.